Hi all! I'm really sorry for basically disappearing this month- my last post was on Halloween! My first year at university is proving to be killer and I finally finished all of my midterms (nine of them!) I think I made some poor decisions with my academic planning but we live and we learn, right? I'm counting down the days until winter break so that I can get everything back in order. I say this way too often but I truly mean it: thank you, thank you, thank you for sticking around! After my last midterm I was finally able to treat myself with some real nail art. Here I took another try at the watercolour technique. My first attempt was this floral design, where I explain the technique in-depth. Basically, it uses nail polish remover to disperse the pigment in the nail polish, creating this cool effect. I started off with American Apparel Summer Peach. On my thumb and ring finger I used scotch tape to section off the triangles. Then I used American Apparel Rose Bowl, American Apparel L'Esprit and American Apparel Cameo Blue for the watercolour. Thanks for looking and I hope to post again soon! Haha, yikes indeed! Thank you, as always! 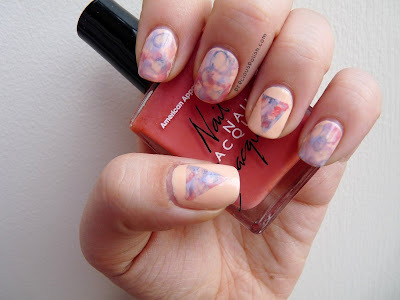 THIS NAIL ART IS THE BEST ONE I EVR SAW IN MY LIFE . love it! !